I am not much for labels but since others are I am sure that there is some psychiatric term for this issue. I am not so much a food hoarder as I am a "cannot pass up a food bargain and must buy it in bulk" person. The question is if it is actually a compulsive problem. I do not trust myself to be objective about this, so just let me explain to you how this happens to me. My daughter and I had some extra time some weeks ago before her piano lesson so we drove around and I saw this store with a huge sign reading "CLOSEOUTS" in red letters. Maybe I was in trouble already? Then I saw some large pet crates outside the store. I had sold a rabbit over a year ago to the guy that cleans our carpets and he still has not returned the crate, so I hoped they were have small ones too. That was my justification for stopping in to look around, as if I would not have thought of another if the crates had not been there. No small crates but—oh, my!—light fixtures. I have been wanting to replace the one in the master bathroom since we moved in over 15 years ago. The price was so very low and I really liked two of them, but we did not have the time nor the budget envelope for household items, so I began to plan coming back the next week. As we were leaving the cashier calls out and asks if I had seen the cheesecakes in the freezer for $5. Not just plain old cheesecakes she tells us, but 10" Cheesecake Factory cheesecakes that go for about $7 to $8 per slice in the restaurant and from $42 to $52 for one whole. Now I ask you, what would you do if you were me? Would you not even look? Would you tell yourself that there is absolutely no way cheesecakes would fit into your full freezers, or would you begin thinking that you would find a way to fit them in? Yeah, that is exactly what I thought too. The cheesecakes there were already sliced and just a few were a mix of flavors among several plain but just a bit brown on the top. I could not resist, but knowing that my freezers may not close, I reluctantly limited myself to two. If there had been more space, I probably would have bought five or six. (Apparently, I was not the only one with such aspirations, as the clerk told me I just missed the lady who bought 15 of them.) We shared one with friends about two weeks ago and everyone else had two pieces but I only had one: a caramel top with mini dark chocolate chips to die for. I just could not see anything that would surpass that one luscious piece. Mmm. Hence, my problem of wishing I had gotten more. I really dislike that feeling, which is probably why I much prefer getting more than enough along with the feelings of guilt for having so many. Unfortunately, "more than enough along with feelings of guilt" are associated with several items, which is why my freezers are full (of my guilt). Over a week ago I decided to tackle my refrigerator for a thorough cleaning and reorganization. We have been making raw dog food for nearly a year, but it was put in an inconvenient place. We also have been juicing or making smoothies for nearly as long so I decided to change where some items are kept. I confess that I have not done the door yet, but it could use a bit of the same. Instead of finishing the refrigerator, I decided to work on the freezers in the garage on the following Friday; that would be the Friday before last. We have a deep chest and an upright. The upright is used mostly for frozen vegetables and fruit and small frozen pastas. I also used it for storing butter, cream cheese, shredded cheese, bags of flour, and some seeds and grains. The upright is far more convenient to organize and find for what you are looking, but it is also far more work to defrost because the frost builds up between the grates sandwiching the cooling coils. However, a warm air blower does help to speed up the process. Also, my husband was home and had some time to help out. I marked all the bags with the sell-by dates on the front with a marker and put them in order of oldest to newest. I planned to inventory them with my Out of Milk app on my Kindle, but I have not done it yet. I decided that since the butter could have things placed on top of it, that I could move it to the deep freezer for a time, but I have been thinking of moving it back and stacking some of the vegetable bags on top of them on the top shelve since there is some space to do so there. I use cardboard crates saved from bulk purchases of Santa Cruz lemonades from Whole Foods the last few years. They fit well, keep the items organized, and are easy to remove and restock...when the frost is not overwhelming. I also decided to move the raw milk to the upright on the second shelf for easier access. Each freezer is nearly an all day job, not because of the defrosting so much, but it takes time to organize them when so many bags of frozen fruit and vegetables had been tossed into the chest freezer where I knew, of course, they did not belong and I would get to them sometime...later. This was that all so dreaded later. I began on the chest freezer the next day, Saturday. Unfortunately, there was a great deal of ice built up inside the lid of the freezer. That ended up taking far longer than I planned as I waited for it to melt enough to break it up and reach it to pull it out through the hole where the light was supposed to be. I did it, though. I placed the three gallons of frozen organic pasteurized milk, this I buy for half price when it is near the sell-by date and only use for making yogurt, in the bottom crate where the raw milk used to go and stacked the short crate on top. Just fitting inside the short crate, I stack filled three lock top round plastic containers that protect my pie crusts and other crushable baked goods. Everything just fits in height so that the freezer lid will close. I used four of the five thick, strong, short, plastic crates for soda cans and bottles bought for a $1 each at a yard sale earlier that week to organize other areas and items as they can be lifted out. However, one problem is that we have too many rabbit pelts plus a deer one taking up about a 20% of the chest freezer that need to be either tanned or tossed. I was hoping that we would learn to tan them ourselves and we made one attempt with the rabbit hides, but they did not turn out as pliable as they should have. I would like to try again, as we have plenty with which to experiment, but we may trade some for having them tanned by someone who has the experience. Another problem is simply that I have too much food. The chest freezer is completely full—completely! No amount of organizing really helps when there is just too much stuffed in the freezer. And, I have not even begun to buy the grain for grinding in my grain mill (which I do not have yet either but more on that story later). We were a bit low on some frozen vegetables and I have no homemade biscuits or rolls or pizza crusts in the freezer, but other than that, I need to stop buying foods that will go into the freezer for a while—unless that place gets more cheesecakes. I know it's crazy, but it is just so hard to pass up a tasty bargain! 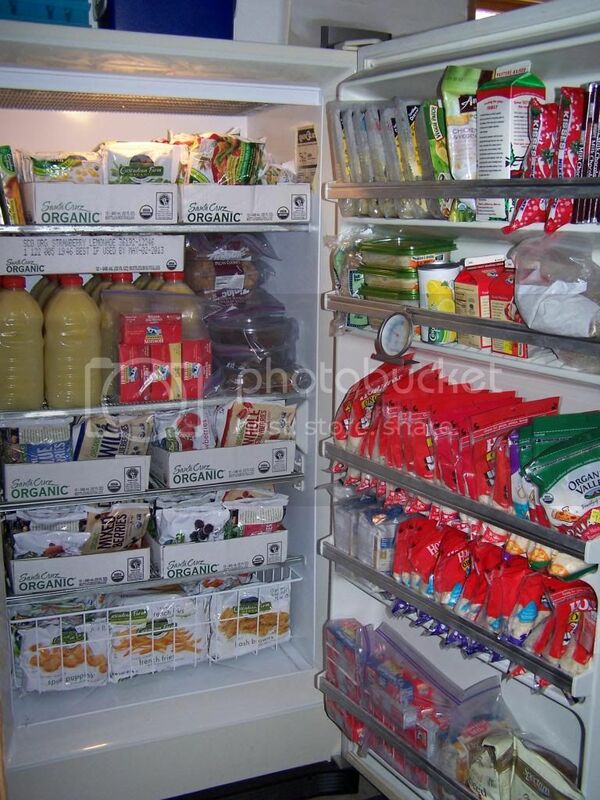 So, now I have all my cold storage organized, defrosted, and clean, or I will have as I am about to tackle the door of the refrigerator today. I have added a new favorite store to shop on our errand day as if we did not have enough to do on that day already. Oh, and just in case you were wondering, I did get the new light fixture for the bathroom. We will not be putting it up until—well, the master bathroom still has the same decor it did when we moved here and needs redecorated so....uh, yeah, I haven't even got the areas I wanted reorganized yet and now I am already contemplating another project that will tear up a room for awhile. I am sure there is another psychiatric term for this as well. It seems I am hopeless!